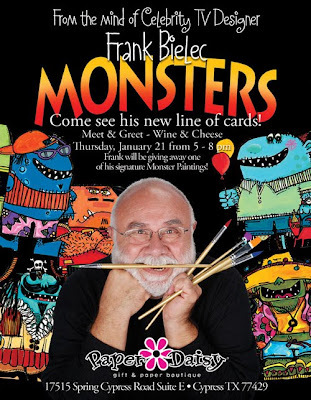 Frank has a line of "Monster" art invitations and they are adorable, the Monsters come in a wide variety of situations/themes you would typical being looking for when having a party for children and adults. Cute, cute, cute stuff!!! When I say typical, I only mean if your have a circus party I saw one for that with the Monsters, one with a fiesta theme, but they are by no means typical, they are precious, unique, fresh and lively. Don't we all have a little monster in us? He's been on Trading Spaces since the first episode in September of 2000, and called the "King of Country"
Frank lives in Katy, TX with his wife where they run an online business Mosey n Me (www.Moseynme.com)since 1989. Frank was originally an elementary school teacher ( he holds a bachelors degrees and masters in education) as well as a masters in Fine Arts. After eight years as an educator Frank left and pursued a career as a florist for twenty years. On top of Trading Spaces and Mosey n Me, Frank now has his new line of Monster cards to be excited about. If your heading to the Paper Daisy to meet Frank and check out everything he has, and everything the Paper Daisy has (like the chalkboard jars in the post below), let me know I'll be their.